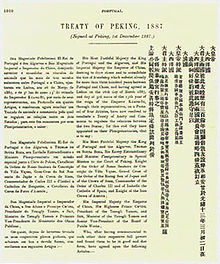 The Sino-Portuguese Treaty of Peking was a trade treaty between the Kingdom of Portugal and the Qing dynasty of China, signed on 1 December 1887. It is counted by the Chinese as among the unequal treaties. On 13 August 1862, China and Portugal signed the Treaty of Friendship and Trade in Tientsin (Tianjin). The treaty was largely a trade agreement but it also defined Macau's political and juridical statue, although it did not directly mention the issue of Portuguese sovereignty. It contained two clauses regarding Macau's status: Article II annulled earlier agreements and referred to Macau as "formerly in the Province of Canton", while Article III recognised the status of a "Governor General of Macao". However, China did not ratify the treaty and it become void in 1864. Art. 1st.—A Treaty of friendship and commerce with the most favoured nation clause will be concluded and signed at Peking. Art. 2nd.—China confirms perpetual occupation and government of Macao and its dependencies by Portugal, as any other Portuguese possession. Art. 3rd.—Portugal engages never to alienate Macao and its dependencies without agreement with China. Art. 4th.—Portugal engages to co-operate in opium revenue work at Macao in the same way as England at Hong Kong. II. China confirms, in its entirety, the second Article of the Protocol of Lisbon, relating to the perpetual occupation and government of Macao by Portugal. III. Portugal confirms, in its entirety, the third Article of the Protocol of Lisbon, relating to the engagement never to alienate Macao without previous agreement with China. According to the Portuguese interpretation, sovereignty over Macau was surrendered to Portugal. In the Chinese interpretation, only administrative rights were transferred. After December 1887, issues related to rent payments and the presence of a Chinese custom house or resident mandarin in Macau became irrelevant outside of academic interest. The early 20th century marked a new era for both countries, with Portugal's 1910 and China's 1911 republican revolutions establishing new governments. A growing nationalist movement in China voiced disapproval of the treaty and questioned its validity. These contentions manifested themselves in the unresolved topic of Macau's border demarcation. Although the Nationalist (Kuomintang) government in China vowed to abrogate the "unequal treaties", Macau's status remained unchanged. The 1928 Sino-Portuguese Treaty of Friendship and Trade reaffirmed Portuguese administration over Macau. In 1945, after the end of extraterritorial rights in China, the Nationalists called for the liquidation of foreign control over Hong Kong and Macau, but they were too preoccupied in the Chinese Civil War with the Communists to fulfil their goals of a "rights recovery" campaign. After the 1974 Revolution in Portugal, a new decolonisation policy paved the way for Macau's retrocession to the People's Republic of China (PRC). Portugal offered to withdraw from Macau in late 1974, but China declined the offer in favour of a later time because it sought to preserve international and local confidence in Hong Kong, which was still under British rule, and also because it prioritised the reunification of Taiwan. In January 1975, Portugal recognised the PRC as the sole legitimate government of China and ended ties with the Nationalists in Taipei. In 1976, Portugal unilaterally changed the legal designation of Macau from a "colony" to "territory under Portuguese administration". In 1987, the Sino-Portuguese Joint Declaration was signed and Macau became a "Chinese territory under Portuguese administration". On 20 December 1999—two years after the handover of Hong Kong—Macau was returned to Chinese rule. ^ a b Mendes, Carmen Amado (2013). Portugal, China and the Macau Negotiations, 1986-1999. Hong Kong University Press. pp. 11–12. ISBN 9789888139002 . ^ a b c d Ride, Lindsay; Ride, May (1989). The Voices of Macao Stones. Hong Kong University Press. pp. 54–56. ISBN 9622094872. ^ Cohen, Jerome Alan; Chiu, Hungdah (1974). People's China and International Law: A Documentary Study. Vol. 1. Princeton University Press. p. 374. ISBN 9780691618692. ^ Chan, Ming K.; Chan, Shiu-hing Lo (2006). The A to Z of the Hong Kong SAR and the Macao SAR. Plymouth: Scarecrow Press. p. 283. ISBN 9780810876330. ^ Oliveira, Jorge; Cardinal, Paulo, eds. (2009). One Country, Two Systems, Three Legal Orders - Perspectives of Evolution: Essays on Macau's Autonomy after the Resumption of Sovereignty by China. Berlin: Springer-Verlag. pp. 225–226. ISBN 9783540685722. ^ Page, Melvin Eugene. Sonnenburg, Penny M. (2003). Colonialism: An International, Social, Cultural, and Political Encyclopedia. ABC-CLIO. p 359. ISBN 978-1-57607-335-3. Tam, Camões (1994). "The Sino-Portuguese Dispute over the Holder of Sovereignty of Macao and the Friendship and Trade Treaty Between China and Portugal from an International Law Perspective". Review of Culture. No. 19 (2nd series). Cultural Institute of Macao. This page was last edited on 24 August 2018, at 13:16 (UTC).